Love, love , love the tutorial. I'm making my daughter's 1st bday in November and this background would be perfect for the theme. Thank you for taking the time to this! Oh this is so exciting! I am looking forward to each post and saving this amazing idea!! Wow!!! I loved this backdrop but thought it must have been a commercial project so l put it in the too hard basket but I am excited to learn more and so happy you are sharing your know how!! It is just a gorgeous backdrop and would make an impact at any occasion!!! Thanks for taking the time to share!! 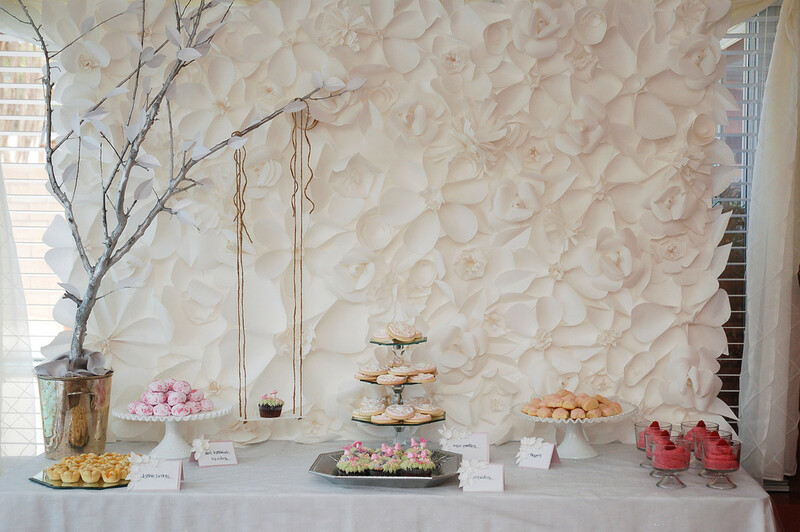 This is so neat and the perfect back drop I want to have at my daughter's 1st bday party! Love!! Sooo pretty and creative!!! Can't wait to see how you finish up the project!!! Thank you for sharing this! It would be the perfect backdrop for a mother's day brunch or adding a little edge of embossing glitter would be fun too! I love how yours turned out...so creative! Thanks for sharing, love the idea and the your tutorial! thank you so much for sharing your beautiful backdrop! I noticed it in the photos and thought it was so amazing! Such a show-stopping piece! And you are so sweet & generous to share the complete step-by-step process! This would be fabulous for a bridal shower, don't you think? I love the overall simplicity in this whole party design, but the backdrop is definitely a stunner. Thanks for sharing the "how to". The event styling is sublime! Thank you for posting DIY instructions for the flower backdrop! I need to make this for my next birthday party. Gorgeous!!! Elegant and makes a world of difference! Can't wait to make this with our friends for my baby sister's baby shower in November! Thank you oh so much!! So so lovely!!! So, after you've made the flowers. Are they all just glued, or otherwise attached, to large backdrop-sized strip of the same paper? Or is it something more substantial on which they're mounted? Also: how many hours do you estimate this project took you, all told? Whoops! You answered both of my questions in Parts II and III. Thank you for such a wonderful and thorough tutorial!! How did you hang it on the wall? It's absolutely stunning!